Rose champagne is enjoying high demand and not just because of Valentine’s Day. Rose Champagne, or Pink Champagne as it is more commonly known, if not a little mincing, has become increasingly vogue over the last few years. Indications are that its popularity is becoming more entrenched and it is easy to see why, with an appealing bouquet of fresh strawberries, added dimensions of flavor and complexity and more allure than normal (white) Champagne. In the savvy London wine market, merchants report demand is far outstripping supply with the better quality wines out of stock for several months. This might go some ways to explaining why Pink Champagne is more expensive than normal Champagne, as there are is no other logical reason why. Take the luxury cuvee non-vintage (NV) Krug Rose, which is more expensive than their sublime and highly acclaimed vintage Clos-des-Mesnil Blanc de Blancs (100 percent chardonnay). I cannot understand why a single vintage wine, made only in the very best years, can be less expensive than a blend that is made from a number of vineyards and vintages. Is it simply because it’s pink? 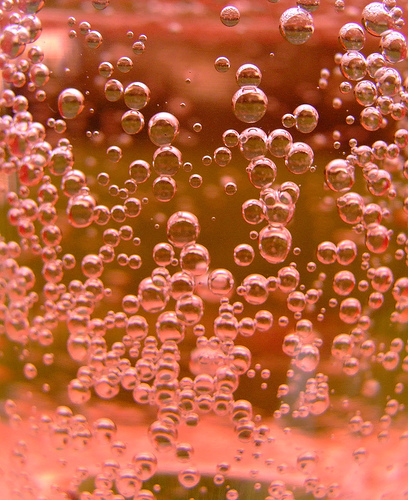 Pink champagne is no more labor- intensive to make; it does not involve higher production costs. In fact, the majority of pinks are made rather simply, by mixing a little red wine with the white just before bottling. Apparently this facilitates greater control and consistency of color, however one has to question the ethics of this when Champagne is the only region in France that is legally allowed to do this. Serious producers, though, make a rose base wine by allowing brief contact between the pressed grape juice and the black skins of the pinot noir grape, achieving the desired level of “pink,” then applying the champagne method. This way of extracting pigment is called saignee, roughly translated as bleeding the color from the skins, which a handful of champagne producers promote on their labels, although it is more commonly encountered with non-bubbly roses. Generally, pink champagne is a traditional blend of two-thirds black grapes (pinot noir and pinot meunier) and one-third white (chardonnay). The higher the content of pinot noir, the more elegant, complex and flavorsome the finished wine will be. You may find rare examples using entirely pinot noir which deserve far more attention and hopefully might encourage more producers to follow suit. Perhaps the most worrisome trend in pink champagne is the rising number of wines with a high level of sweetness on the finish, no doubt a result of targeting a wider audience. Any serious producer will be judicious when adding the dosage (the grape and sugar solution added at the final bottling stage that determines the level of dryness) to achieve a mouth-watering, subtly dry farewell. This is a balancing act between the perceived sweetness of strawberries and tangy acidity, ideally with a finish that is neither too sweet nor too dry. Unquestionably the most appropriate wine for romancing, there is indeed something naughty about Pink Champagne, “Mirrors on the ceiling, Pink Champagne on ice. And she said, we are all just prisoners here of our own device”, its seductive mystique encapsulated in the lyrics of The Eagles, Hotel California. If you are still contemplating your romantic Valentines Day scenario, can I suggest an evening at home with a candlelit meal that you have lovely cooked for your partner, then luxuriating in the surrounds of your lounge room (or bedroom!) with a bottle of non-vintage (N.V.) Billecart-Salmon Rose and the DVD of “An Affair to Remember”. This classic shipboard romance starring Cary Grant, “He is Pink Champagne to her, fun but sure to lose its bubble”… and Deborah Kerr “She’s smart and strong-willed and loves Pink Champagne” virtually guarantees to induce a teary, cuddly, amorous mood. And with a reputation built over seven generations of family ownership, the NV Billecart-Salmon Rose is indisputably the best pink champagne on the market for consistent quality and value. Actually, I would rather refer to it as Rose Champagne, as suggesting this wine confine itself to a romantic lubricant simply does not do it justice. It is a blend of 40 percent pinot noir, 20 percent pinot meunier, and 40 percent chardonnay, and it undergoes an unusually cold fermentation to achieve an exquisitely elegant style that is so mouth-wateringly fresh you will never tire of drinking it, no matter the circumstances. An engaging pale salmon pink in color with a coppery twinkle, it is delicately perfumed with a melange of ripe strawberries, pears and golden apples. A little swirl of the glass releases the subtle aroma of lavender, dried flowers and rose-petals with a nutty, roasted almond nuance indicating some bottle age. Lively throughout with racy acidity, tiny slow rising bubbles deliver a gentle prickle to the palate, initially saturated with sweet strawberries, surrendering to tart raspberries, orange blossom tea and savoury complexities that merge with a juicy rounded finish. I tasted a half bottle which showed some development, indeed drinking absolutely perfectly. A full bottle, depending on the source, may be a little more youthful, highlighting the fact that this style of non-vintage rose champagne does benefit from bottle age. If you and your sweetie are out on the town, the Four Seasons Hotel at IFC2 has NV Billecart-Salmon Rose listed at HK$960 per bottle, just a tad above the retail price. Their philosophy is to offer fine wines at reduced-margins to make them more accessible, which is extremely commendable given that international hotels and restaurants in Hong Kong normally work on rigid and prohibitive mark-ups. You can also enjoy a glass at the Grand Hyatt Champagne Bar, although they will charge you HK$340 per glass or HK$1,650 bottle.